Hindbærsnitter (means raspberry slices) is a popular cake in Denmark. The idea is simple: two layers of butter dough, raspberry jam between, sugar glaze on the top. Why not to play around with the shape? Mix 300 g all purpose flour, 200 g butter, 100 g icing sugar and 1 egg. Let it stay for a couple of hours or overnight. Roll out to 3-4 mm thickness and use your favourite cookie cutter. Place the cookies carefully on a baking tray and bake in a preheated oven on 175 ºC for about 10-15 minutes. They should stay light - watch out, they get burned easily! 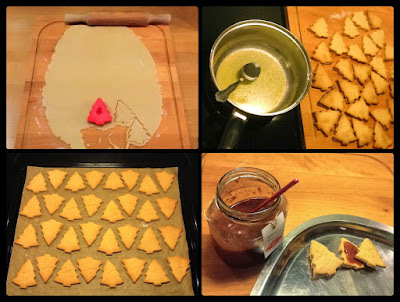 Cool the cookies down and glue 2 and 2 together with raspberry jam or use your favourite jam (mine is crab apple). Finally, make glaze if necessary. 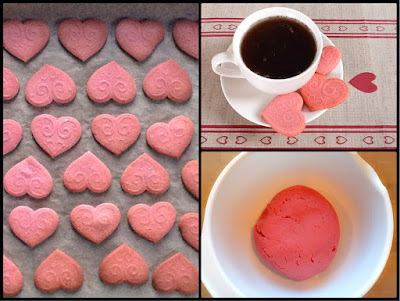 Melt 30 g butter, 30 g icing sugar, 100 g white chocolate and a 2-5 spoon water (add gradually). Melt slowly and stir often. 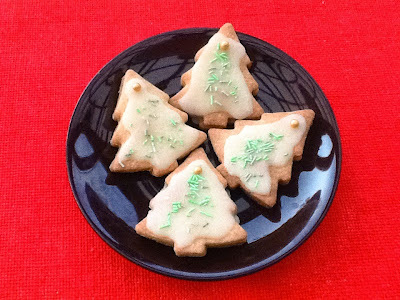 When the glaze becomes soft and creamy, coat the top of the cookies with a glaze brush. Also, you can add colour to the dough or to the glaze or finish the cakes with topping sugar. Posted in Dessert, Snack. Tags: butter, cake, cookies, crab apple jam, glaze, raspberry jam on 15/02/2015 by Maagedeli.